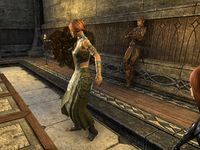 Celebrate the New Life Festival with the Bosmer of Skywatch. Breda, a New Life Herald in Eastmarch, spoke of Skywatch's New Life Festival in Auridon. Go to Skywatch and throw mud balls at ten NPCs or players. Head into the Skywatch Manor and throw a mud ball at one of the three alliance ambassadors. Return to Breda to claim your reward. Speak to Breda, south of Windhelm, who informs you of a wood elf tradition: throwing mud balls! To complete this quest you will need to throw 10 mud balls at NPCs or players. For the quest, you must go to Skywatch in Auridon, but you can throw mud balls in any zone (excluding Cyrodiil and the Imperial City). In fact, if you wish to complete the achievement associated with this quest you will need to throw mud balls in two or three other zones. "Wood Elf immigrants to Auridon introduced the locals of Skywatch to Mud Ball Merriment. It is as you'd expect—mud balls thrown at everyone. But each year, there is a specific target the Wood Elves agree most needs to be humbled." Who is this year's target? "There are three! Ambassadors of each Alliance meet in Auridon to speak with righteous purpose. No doubt to argue the shape of the negotiating table, or which wine to serve next. They should take themselves less seriously, don't you think?" All right, I'll introduce them to the Mud Ball Merriment. Breda will give you a Mud Ball Pouch. You need to throw 10 mud balls in Skywatch. Near the wayshrine, there are many NPCs grouped together celebrating the festival; they are a good target. You can also throw mud balls at other players. Next, you will need to hit one of the three alliance ambassadors with a mud ball; Camore, Arnand Relippe, or Tolendos Dreloth. Any ambassador will complete this stage of the quest. They are all located in Skywatch Manor in the first room on the right. Be aware that hitting a guard will net you a small bounty. Hitting regular NPCs around Skywatch, such as the revelers, will not incur a bounty. You will need to make sure Prevent Attacking Innocents is turned off in your Gameplay settings if you are unable to throw the mud balls at an NPC. Return to Breda for your reward. "Is that a bit of mud on your hands? How was your visit to Skywatch?" I took part in the Mud Ball Merriment. "Wonderful! Mud on the face reminds us that life is not always so self-important. With the New Life comes a bit of fun, for those who aren't too proud to take part." To participate in Mud Ball Merriment, I should first head to Skywatch and throw mud balls at anyone who looks too stuffy to enjoy themselves. To participate in Mud Ball Merriment, I should throw mud balls at the Alliance ambassadors. They can be found in Skywatch. This page was last modified on 21 December 2018, at 11:58.